We have three contests to draw the winners for today, but four winners in all! Don't you just love contests with multiple winners? Out of 425 entries, the two winners of the Baby Bunch Bouquet contest are . . .
Out of 704 entries, the winner of the $25 Macy's GC contest is . . .
Out of 615 entries, the winner of the Things Remembered Flutter Heart Bracelet contest is . 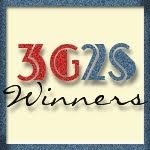 . .
Congratulations to our winners and thank you to everyone who took the time to enter these contests! I will be sending out official email notifications right away. Please remember that I always respond to confirm that I've received your information.